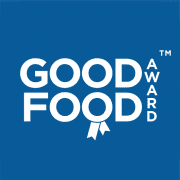 Good Food Awards – Fine Dining, Cafes, Bistro’s and Restaurants. Good Food Award for Gastro Pubs – Gastro-Pubs, Inns, Taverns and Public Houses serving Food. Good Food Award for Fish & Chips – Fish & Chip shops where Fish and Chips are their primary activity. Good Food Award for Takeaways – All other Takeaways where Fish and Chips are not their primary activity. Good Hotel Awards – Hotels, B & B’s, Serviced Apartments and Guest Houses. Our Good Food Awards are by invitation only and each year we hand pick selected eating establishments to join our prestigious awards programme. Many have received additional publicity and customers from our award thus underlining the importance of our programme and as our awards symbolise only the very best in their field we are recognised as the “blue ribbon for delicious dishes”™. We have been founded on independence and integrity, we do not take on advertising and every award is issued based on our strict policy scorecard and repeat winners have to maintain the initial standards that gained them entry. Our awards are free of advertisers, free to enter, and appearance in our awards is completely based on merit and free. As you have come this far why not make a nominatation today. Formed in 2002 we had only one vision, to synergise awards throughout the catering industry. Our awards programme has gone from very humble beginnings to the great success it is today. Some premises will appear in our awards programme regularly but they must earn their place every year by maintaining the same high standards that gained them initial entry into the Good Food Awards. The Good Food Awards are compiled, scored and written each year so there are always new entries and deletions. See what makes a Good Food Award Winner in the info graphic below. Our revered awards programme is highly regarded as we base them on: tasty Delicious Dishes, Ranking amongst competitors, Consistent positive customer feedback and a Great Food Hygiene Score. We then apply a score to these and other attributes to form our Food Score™, based on our policy scorecard. Once a Food Score™ has been attributed to each of the premises in our database we then use statistical modelling to carefully select only the finest within their respective fields. We cannot guarantee that all premises in the UK are scored, as many establishments are opened and closed throughout the year. Business owners can register their interest to be included and readers can also make nominations too. As at 19 June 2016 some 76,631 establishments would not be eligible to enter our awards programme based on their Food Hygiene rating alone, just one example of how high we set the bar! There are always subjective aspects to rating systems, but we have been delighting our readers since 2002 and our Executive Editor is equipped with extensive scoring guidelines to ensure that benchmarking throughout the UK is accurate and up to date. * 2017 / 18 Saw the introduction of our Good Chippy Awards and Good Takeaway Awards which led to a number of potential awardees receiving recognition from our sister publications.